The BM5 mkIII is the next generation of the tremendously successful BM5A MKII. With greater SPL, broader frequency and power response compared to the previous model, its ultra-high dynamic range and hand-crafted drivers deliver performance superior to many larger, more expensive monitors. Potential uses for Dynaudio Pro’s BM5 mkIII reach every aspect of sound engineering and reproduction. These active studio monitors are ideally suited to music and speech monitoring and mixing, radio station, OB vehicles, edit suites, post production, recording studios and playback rooms. The possibilities are endless. The BM5’s compact size merged with exceptional performance means they are perfect for use as rear channel speakers in surround systems. 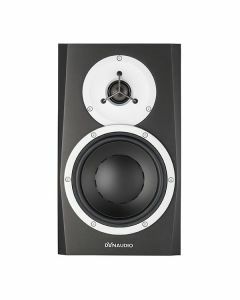 In addition, they’re also suitable for a full-blown 5.1 system, in smaller rooms, in conjunction with the BM14S. The BM5 also utilises a DSP crossover, with a crossover point at 1.9kHz, which feeds two high performance discrete RMS Class D amplifiers rated at 50W each. A low frequency equaliser drives the low frequency section, providing a choice between extended, critical damped response or more conventional higher Qt response - giving out a more level but less low frequency output. A complex protection circuit is included in the internal electronics. This helps to prevent accidental damage to the BM5’s drivers while still delivering optimum transient response. Extended excursion 7" woofer with pure aluminum voice coil. 1.1" soft dome tweeter with pure aluminum voice coil.